Oh oh dear, I hope you don't get frozen! We had 10 cm of fresh snow last night, I'll have to get out the snowshoes. 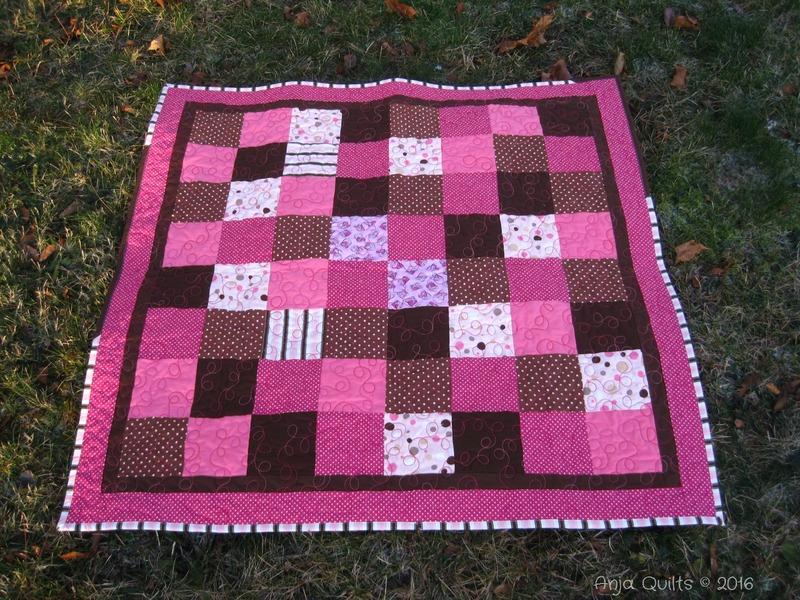 The quilt looks nice and snuggly for a not so little baby, congrats on your finish! lovely quilt Anja! Snow ughh....we have enough of our own right now. It can stop for the rest of winter as far as I'm concerned. So cute! I just love pink baby quilts - I'm working on one myself right now! And I'm so not a Winter person either. It was -34 celcius in Montreal yesterday - there's just no way to hide from that! And it's snowing today. Hence why I'm reading blogs and spending time in my sewing room. Yay for a finish! Finishes are the BEST!! It seems quite tame compared to the usual out-of-the-box color schemes you usually pick! Hee! Hee! Anja, I really love this quilt. 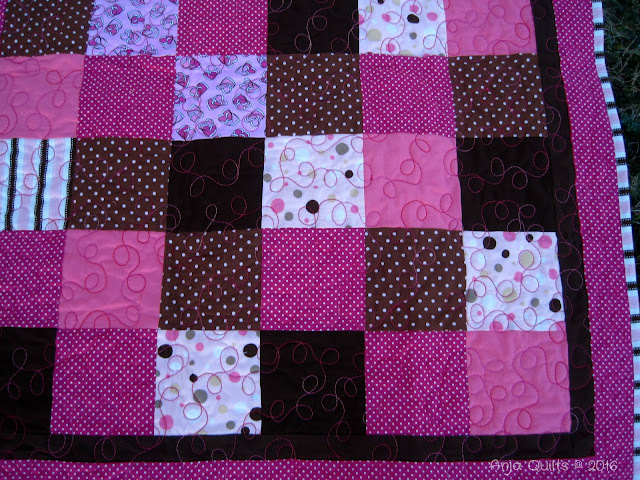 The loopy quilting and striped binding are too cute. Lovely! You can never have too much pink! I have only ever once been almost (not quite) that cold, and that was on the top of a mountain at a ski resort in Japan! I cannot imagine how you can go outside and not die. Your FMQ shows through so nicely! Curious now, will you be waiting for spring so it's color appropriate, or gifting it straight out? 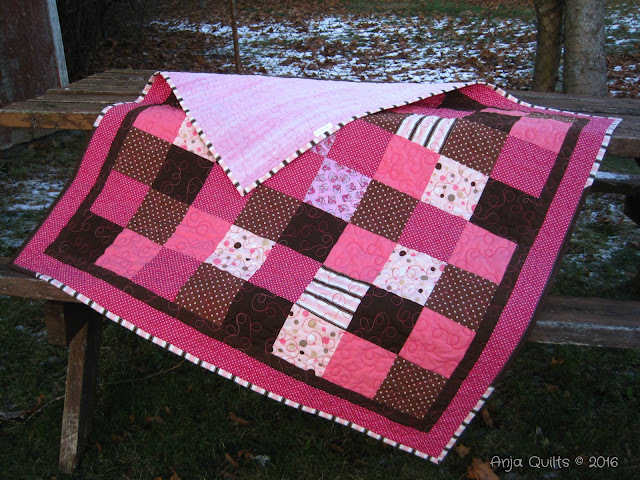 it's a quilt worth waiting for Anja, and your quilting looks lovely. I think you should just stay indoors and quilt all winter, toooooooo cold! While in my corner of Northeast England it is unseasonably warm, 6 degrees celsius today, and I haven't fallen once walking the dogs, win win. I love the pinks in this quilt, they are so bright and perfect for a baby. It's adorable and I really love the colours in the binding. Delayed for events, you're talking to the queen of that syndrome....this is adorable and that baby will likely haul this around until it gets all frayed with love right?